This service by 1st American Protection is on asset protection. How to protect yourself and your assets in these treacherous times? Insulate the assets from threats by positioning your assets so they are out of reach of government, lawsuits and predators. 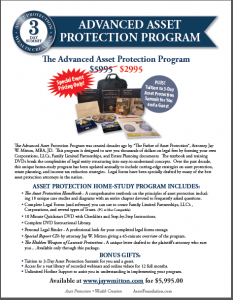 A good asset protection plan is put into place before ever needed. Make assets difficult to discover or too expensive to pursue. Sleep well at night knowing your assets are safe. Frivolous law suits are taking place in America and they don’t have to have a reason or make any sense. Recently, a shopper sued a department store after walking face first into a glass display. A few years ago, two New Jersey men sued Subway when their foot long sandwich came up short. lawsuits like this realize how important the topic of asset protection has become. 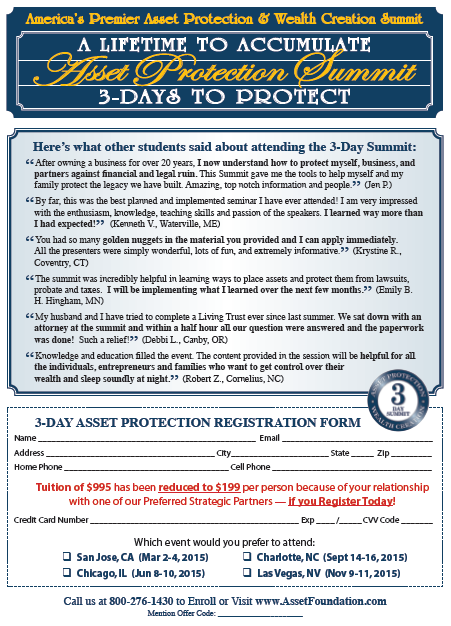 Do not jeopardize the possessions you’ve worked so hard to earn and fail to protect yourself and family from those frivolous lawsuits. Now is the time to restructure your estate or business. 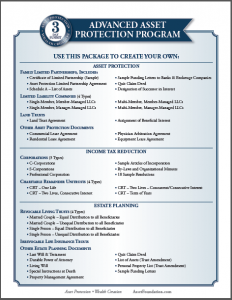 for maximum asset protection and tax savings. America’s lawsuit epidemic is not going away. Learn how to reduce or eliminate estate taxes. By significantly lowering your income taxes and creating your business entities. Unfortunately, most business and or wealthy people don’t do anything and are literately walking around as an easy target with a bulls-eye attached to their back. Recently a man sued NASA for not investigating alien life. A fitness club member was injured after stepping on moving treadmill and sues. Homeowners actually sued claiming their views were ruined by the erected dunes responsible for saving their homes from the water and wind damage caused by the Super Storm Sandy. 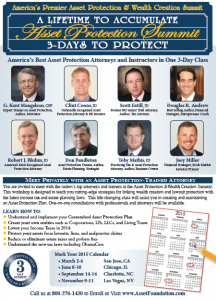 Know of a technique to shield your property and business from frivolous lawsuits? The right answer is being aware of how to get your name off the public records. A typical individual owns everything in their own name. Bond & stock holdings, home, vehicles, their checking, investments, 401 K retirement and savings accounts. One day this individual is involved in a vehicle crash, or becomes the focus of a disgruntled customer or employee and now is involved in a serious legal matter. The individual you have upset visits an attorney and the attorney first will conduct an asset search of the public records to determine how many assets you may own. The attorney then discovers you own assets and agrees to take the case by a “contingency” with no “up front” cost to the disgruntled individual. The attorney is now aware of the conclusion, of the settlement which will turn out quite rewarding. In any lawsuit claim or suit assets are at risk and you have no negotiating power. Taking steps to protecting your assets has never been more important than today. Don’t risk everything only to lose it all in a frivolous lawsuit. Keep your name out of the public records to protect yourself and your assets in these treacherous times. The main key ingredient is to “control” all assets without actually “owning” them. You must protect your financial future and keep your assets isolated from financial threats. To make your assets very difficult to discover or too expensive to pursue. First, let us define “asset”. An asset is anything determined to be of value you want to defend, preserve or protect against any real or perceived hostile third parties. Using a LLC for asset protection strategy will separate high risk assets (cars, business, homes) from low risk assets (bank accounts, stocks, bonds, mutual funds). When you have neither assets nor equity (control without “ownership”) you are essentially “judgment proof”. When a disgruntled party checks the public records and discovers you have no assets they will most likely move on to an easier target. You can protect the built up equity in your home, rentals, or business through a strategy called “equity stripping”. You will have your LLC record a “friendly” lien against your property in an amount up to and exceeding the value of the property which can eliminate the built up equity a “hostile party” could target and go after. Imagine you are in an auto accident and being sued. When the hostile party discovers the registered owner of the vehicle is in an LLC with no other assets, and you don’t own anything valuable, they have to settle in court on a lesser amount. You can also have your business assets, real estate, and equipment owned by a separate LLC (or multiple LLCs) and then lease them back to your business entity. Have you read or seen enough to make a decision? Use the contact us web page. If your decision is yes, then take advantage of having this benefit working for you. 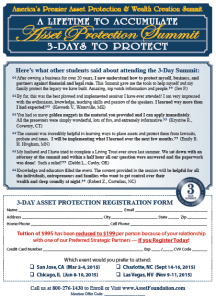 You will greatly benefit from viewing the below video and discover how to accomplish true asset protection with the best information course available. Take action and call 4907-734-5883 for a quick consultation and evaluation.